We were at Kramer Middle School in the Anacostia neighborhood of Washington, D.C., this morning for an exciting announcement. Google has teamed up with One Economy, Qualcomm, and Cricket Wireless to deliver free wireless broadband cards and Internet service to low-income students and families in Washington, a program we're calling Project Change Access. Today we distributed the first of these wireless broadband cards, along with free computers, to several Kramer Middle School students and local residents. Over the next several weeks, up to 1,000 wireless broadband cards will be distributed through our community partners to low-income families across the District. Today's announcement grew out of a pilot program launched last year by One Economy and Cricket to provide free wireless broadband to several hundred low-income families in Portland, Oregon. Students who previously lacked Internet access were able to online resources to help them with their homework. Their parents were able to learn English online, access online job resources, research health care information, and more. The Internet was invented here, but millions of low-income Americans are being left out of the digital revolution. We believe that every American should have access to the immense social and economic benefits of the web. Project Change Access is a small step towards that goal. Check back soon for photos and video from this morning's event. 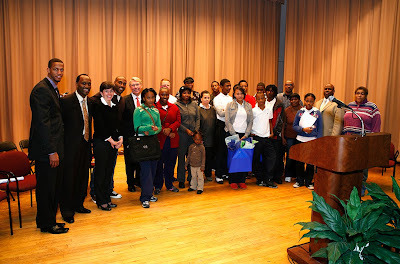 UPDATE (12/9/09): Here's a photo of Kramer Middle School students and local residents alongside representatives of Project Change Access and Washington Redskins cornerback DeAngelo Hall. UPDATE (12/14/09): Here's video from last week's event. This is a great idea, and an important step towards ensuring all income levels can benefit from the enormous promise of the Internet. This is great- but Kramer Middle School is NOT in the Anacostia neighborhood. It is in the Fairlawn neighborhood. ...which is clearly visible from the linked Google Map! do you have pa wireless for free for people who live in nursing homes who cannot get in touch with families?